The time is ripe for sustainable solar vehicles that are practical for everyday use. Students at the Bochum University of Applied Sciences proved this is possible with the thyssenkrupp blue.cruiser. It's a mild 13 degrees in New South Wales in late August. But the small group of students from Germany are still sweating it as they wait with bated breath for customs officials to release their container at Sydney Harbor. The officials check the forms, cross-check the bills of lading against the inventory lists, and inspect the container and its contents. 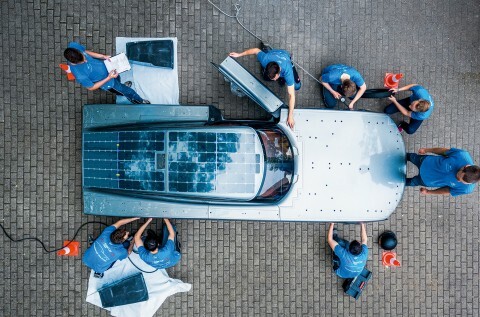 Loaded onto a ship in Hamburg in early July, the container has inside it all the tools and equipment needed for the latest solar car created by Bochum University of Applied Sciences. It also contains much of the luggage of over 50 fellow students: from a car trailer, tents, and sleeping bags through to a partially disassembled car battery. The World Solar Challenge takes place every two years in Australia. It is held on public roads, as the cars traverse the continent from the north to the south. The race kicks off on 8 October in Darwin, on the coast of the Northern Territory. The participants will arrive in Adelaide, the capital city of the state of South Australia, six days later after journeying across 3,000 kilometers. The team from Bochum will take their place at the starting line with the thyssenkrupp blue.cruiser, which will be flown out to the Australian Outback from Germany along with its creators in August. 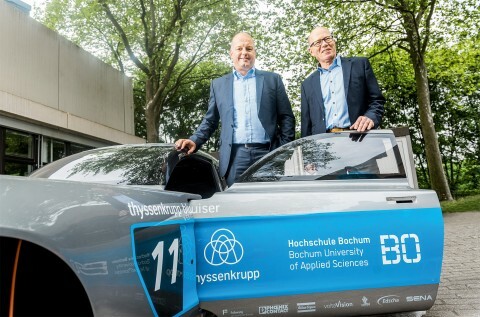 This is the third research partnership between thyssenkrupp and the university, which has been building solar-powered electric cars for over 15 years. The thyssenkrupp blue.cruiser will enter the Cruiser Class event of the race like its predecessor. Success in this category is determined not by speed but by the car’s suitability for everyday use. 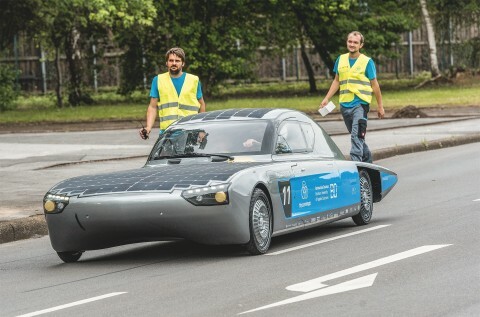 “Our goal is to develop a car that people will actually be able to drive in the near future,” says Friedbert Pautzke, Professor of Electrical Engineering at Bochum University and founding member of the solar car project. Our solar car models are guaranteed to catch everyone’s attention. The vehicle needs to be street legal in its country of origin in order to enter the Cruiser Class event and offer at least two seats – which is no problem for the blue.cruiser, which offers four. The coupe was designed by a student at the prestigious Folkwang University of the Arts in Essen. He created an elegant, dynamic design in close collaboration with the budding engineers from Bochum. “Our solar car models are guaranteed to catch people’s attention,” says Friedbert Pautzke full of pride. We hope that this partnership will make students feel enthusiastic about thyssenkrupp and join us in the future, bringing their research skills and entrepreneurial spirit with them. First pit stop: The thyssenkrupp blue.cruiser is prepped for the start of the World Solar Challenge. 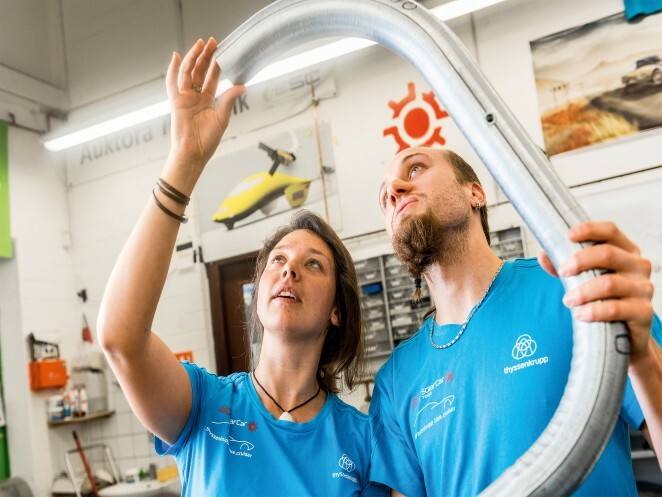 Excellent bending properties: Antonie Bauer and René Berger examine a model of the tube frame. 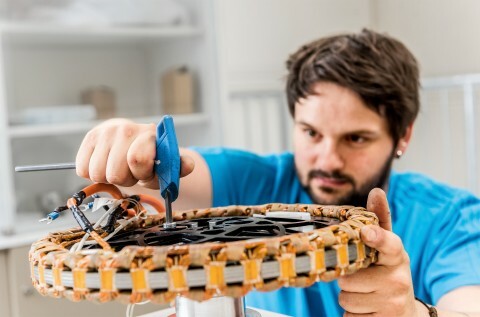 Building from the ground up: Jan Kniprath makes adjustments to one of the motors developed by his team, which features electrical steel from thyssenkrupp. Founding members of the project: Dirk Bartels (thyssenkrupp, left) and Friedbert Pautzke (Bochum University) are pleased to be taking part in the third race together. 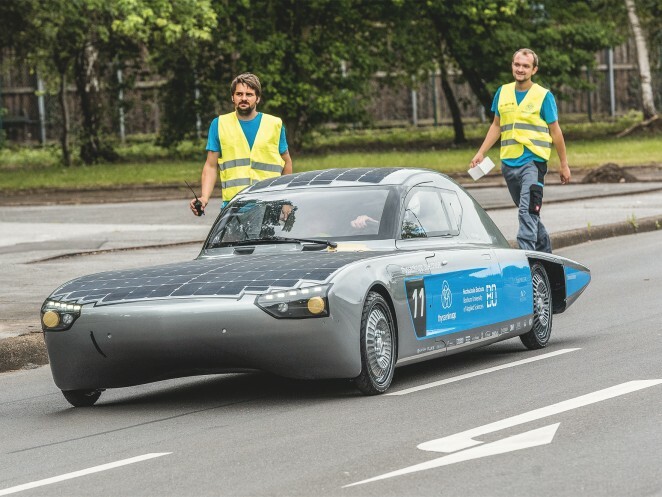 It is finally ready: The solar car team has overcome the last hurdle in receiving approval for the car’s use on public roads. The students are also bound together by a sense of community. Every student who has contributed to the success of the project is entitled to travel to Australia, where they will be given additional responsibilities, whether this is as a member of the technical or media team, the kitchen crew, or transportation team. Even the logistics team will continue to ensure that everything is in the right place at the right time in the coming weeks after the container makes it into the country. The students have already achieved so much. They have gained a tremendous amount of knowledge, insights, and experience as well as self-confidence – regardless of how quickly the thyssenkrupp blue.cruiser reaches its destination in October.